In reviewing more expensive freehold properties that have sold in the greater Ottawa area (details below), more than 35% sold for full price or above! And almost 70% sold for at least 98% of asking price! Definitely a sellers market, and certainly the type of market in which we see multiple offers (Toronto calls them “bidding wars”). So both buyers and sellers should be prepared for potential extra complexity in dealing with offers. This type of summary is very useful. But it’s important to look more closely when considering specific properties: the property itself and the location. For example, only 2 of the homes which got over asking were listed at more than one million. The greatest overbid was a buyer who paid $849,000 for a $699,900 property (121% of the asking price). And a listing at $879,000 got only $600,000. So don’t hesitate to contact us if you have any questions. We’d prefer for you to have the correct information! You may also be interested in our more detailed analysis: Hot Real Estate Market in Ottawa during January to March 2018. Check out our Ottawa Real Estate Market Report for March 2018 and the Royal LePage Performance Realty stats for March 2018. 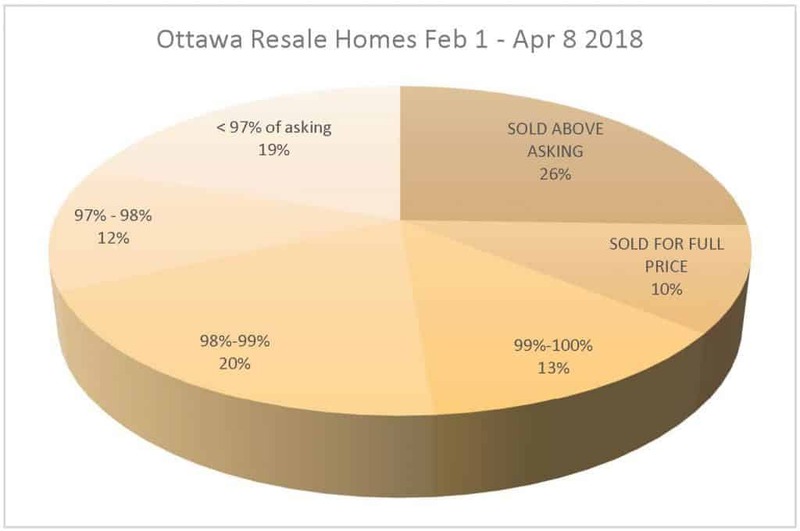 The chart above is based on information from the Ottawa Real Estate Board, for freehold properties of $600,000 – $1,200,000 that sold between Feb 1 and Apr 8 2018.